For me once the Fourth of July commences it feels like the summer has really begun. With that comes day trips, weekend getaways, and long summer vacations. It can be easy to forget healthy habits when tempted with summer treats like ice cream sundaes, campfire s’mores, french fries, and hot dogs. During this time we should not let our nutrition slip off the radar but instead incorporate healthy snacks into the day to keep your blood sugar balanced and prevent you from overindulging in these sugary, processed foods. When on the go, you may not have time to plan ahead. Don’t fret! 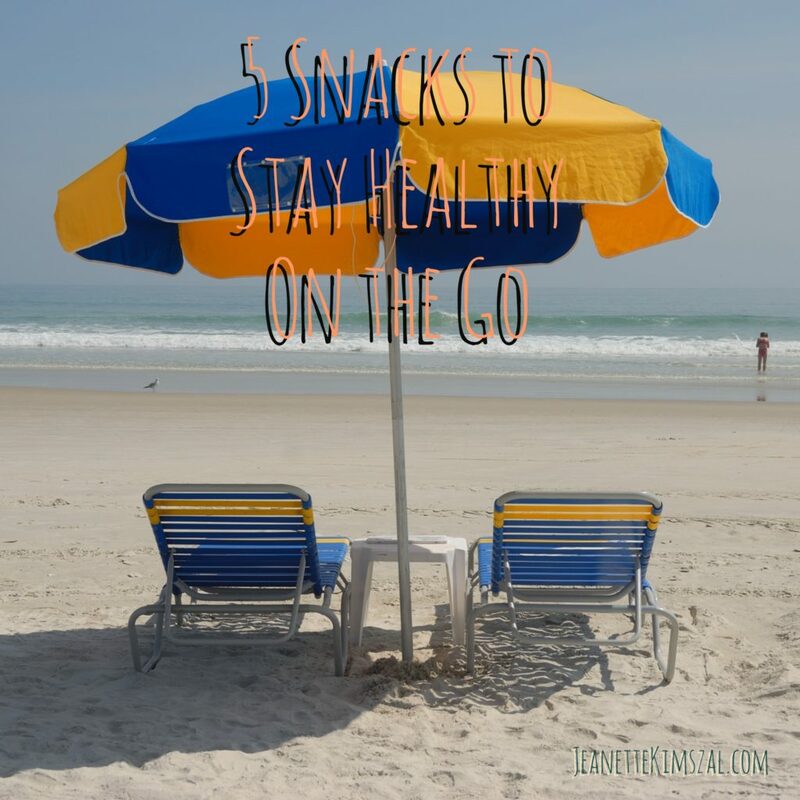 Nowadays there are a lot more healthy options when you’re on the go. So if you are driving to the beach and you feel your stomach start to rumble don’t skip a meal, but pull over to the nearest store and get some food! How do you know if a snack is good? Look at the fiber and protein content. The protein should be at least a minimum of 4 to 5 grams of protein per serving. If you can grab a whole veggie snack that would be most ideal, but often times they are hard to find at convenience stores. If you come across some veggie snacks be aware as they may not keep you full for very long if they do not have a lot of protein or fiber in them. Make sure the product has an adequate amount of fiber and the ingredient list does not look like a paragraph from a story. Raw nuts and seeds: These provide you with an adequate amount of healthy fat, protein, and minerals that will fill you up in between your breakfast and lunch time meals. I like to find ones that have no added oils or sugar. My favorites are raw almonds or walnuts. Meat Bars or Jerky: These may not be for everyone, but they really fill you up though. I have tried Epic Bars Meat Bars and really dig them. My favorites are the lamb, grass-fed beef, and chicken siracha flavors. The chicken has a bit of a kick so if you’re not into spicy foods I would stay away. They do have a little bit of sugar. But if you are looking for a Whole 30 or AIP compliant bar you can try the chicken and venison which have no sugar added. These bars are great because they have a ton of protein which will keep you full. Don’t see any of these? Look for a beef jerky stick that is minimally processed and low (less than 10 grams per serving). Grain Free Crackers: Often clients are looking for that crunch. The one downside to snacking on crackers is they have little to no fiber or protein. Luckily, a lot of companies have been coming out with crackers made from nuts or seeds to provide healthy amount of protein, fiber, and fat to keep you full. Some of the brands include Go Raw Flax Snacks and Flackers. These are crackers made from sunflower seeds and flax seeds. The Flax Snack come two flavors plain flax and pizza. The flackers come in different flavors too. Edamame, lentils, beans, or chickpea snacks: If you can tolerate legumes, chickpeas, and beans, they are a great snack to fill you up. They even have fava bean and chickpea snack foods that have adequate protein, fiber, and healthy fat. Edamame is another great choice for snacks. Be sure they are not overly processed with only a few ingredients. The Good Bean and Enlightened are two brands that I have tried and liked the way they taste. They have some added oils in them but are expeller pressed. Another bean snack I like are the Brami Lupini beans. They are high protein and very filling. One thing to note is the sodium is high so just watch your intake when having these. High Protein Energy Bars: while a lot of these may be higher in sugar there are a few that are grain free and have more protein. My favorites include Rise, Rx Bars, and . These have minimal ingredients. You want to look for at least 5 grams of protein per serving. If there is no added sugar that is an additional win but if can’t find any without look for one with less than 10 grams of sugar per serving. Epic also has protein bars that have no meat, no added sugar, and 12 grams of protein per serving. They have a lemon, almond butter chocolate, and a peanut butter chocolate flavor. If you cannot find these look for ones that have adequate protein and lower sugar. Some other brands include Garden of Life, Bulletproof, and Warrior. Questions about your snacks? Comment below or contact me HERE!